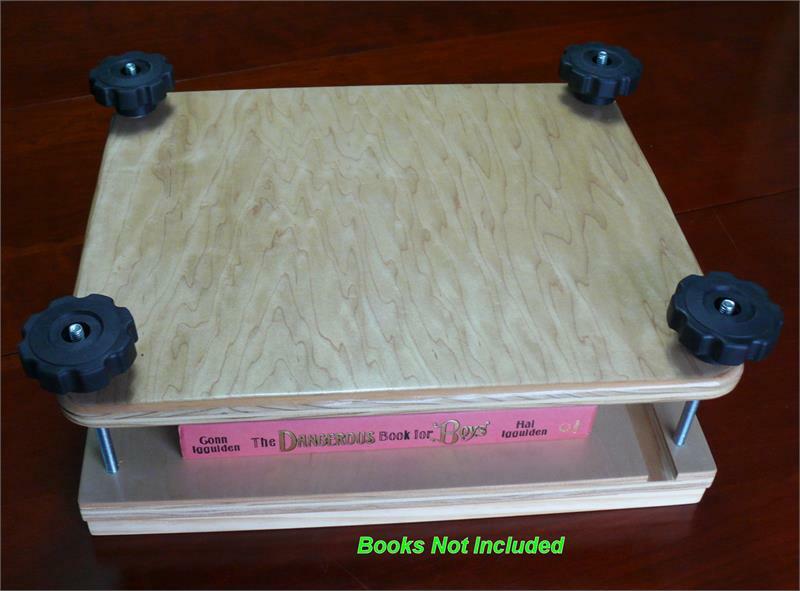 12-1/2" x 13" Combination Book Press - NEW! 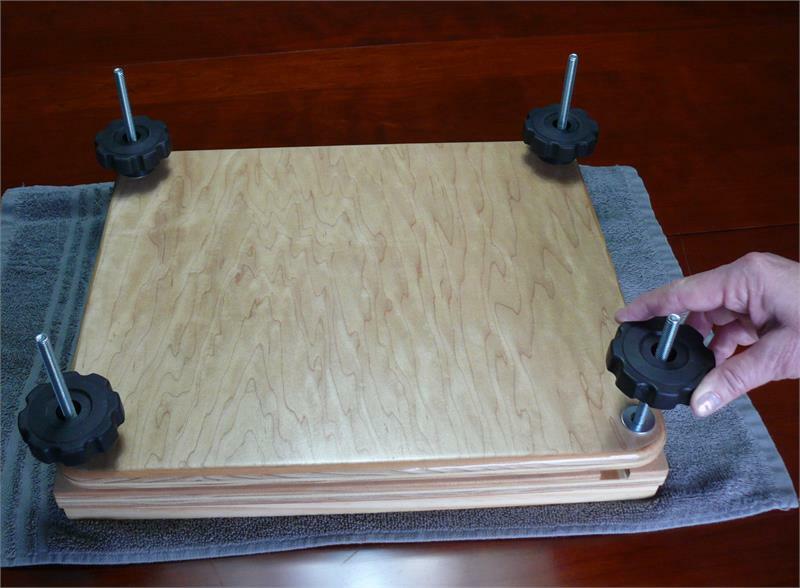 Item # 210-1 is a 12-1/2” wide x 13” deep working area, economical Combination Edge Gluing and Pressing Book Press for making books, note pads, or similar items requiring a firmly pressed edge to glue or finish a binding, with lots of room to press books up to 12-1/2” x 13”. The press converts easily into a full-sized clamping press by exchanging the clamp bar for a full size upper plate. 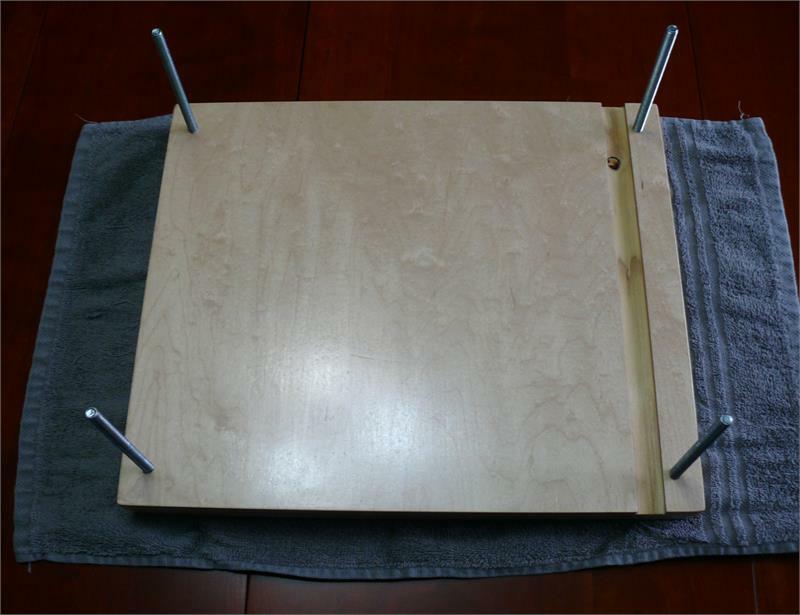 Made from Maple top plywood and select pine, smooth sanded, and finished with Polyurethane. 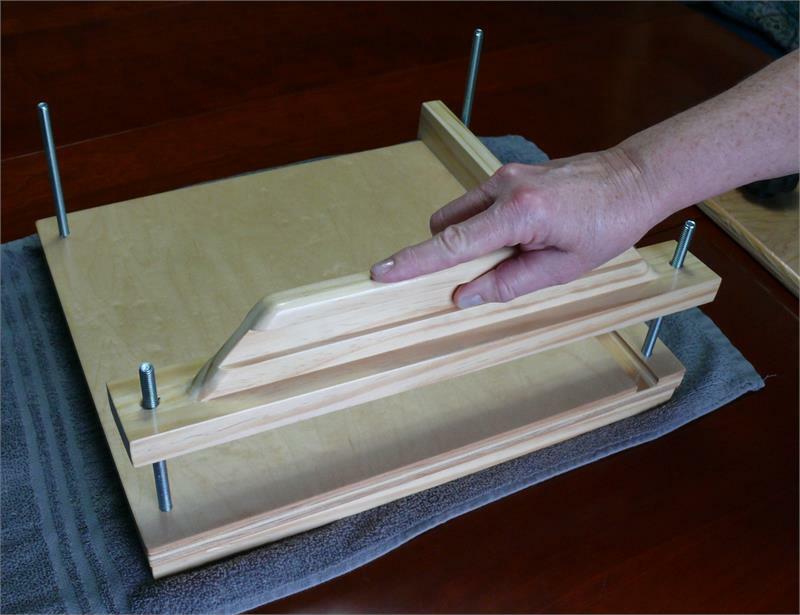 This model is designed to align and press a stack up to 1-1/4” high with a clamping width clearing 12-1/2” wide. The extra-long bolts also give a total opening height of 3-13/16” so thick or multiple books can be pressed flat at the same time. The table is 13” deep, but longer materials can be used as there is no depth restriction. The side is squared with the front edge, although all sides are in square. 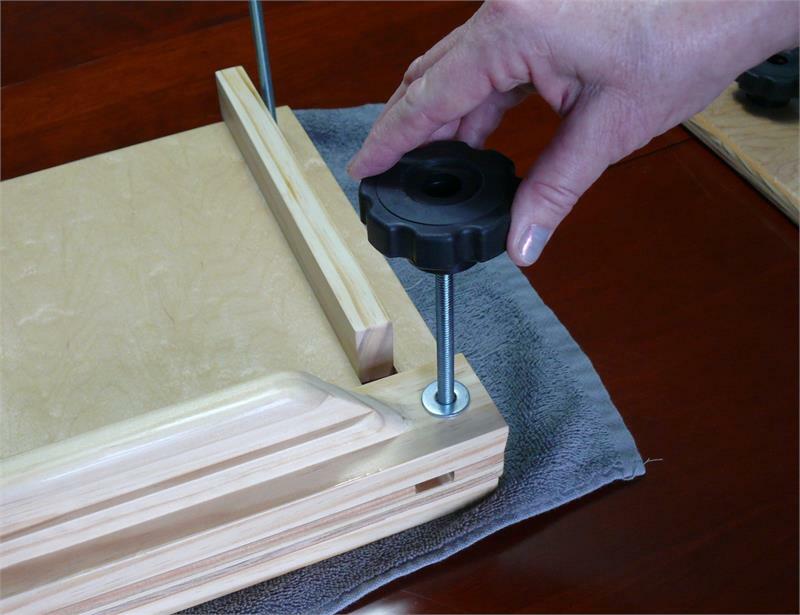 The side rail and Clamp Bar are easily removable, allowing you to install the full sized 15-1/2” x 13” upper plate, turning the edge finishing press into a clamping press. 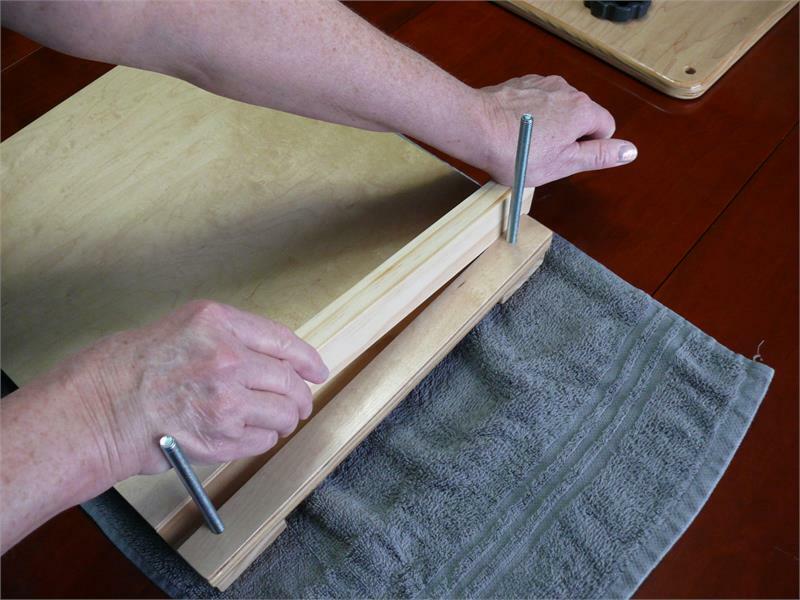 The soft feel over-sized fluted knobs will clear the side rail guide, thus allowing them to be easily spun down holding everything firmly in place, ready for glue, rubber cement, etc. No fighting with wing nuts & hurting fingers trying to get proper clamping pressure. The clamp bar is strengthened with a cross bar that doubles as a handle for easy lifting while positioning your work. Overall nominal dimensions: 15-1/2” wide x 13” deep x 6-1/2” high (top of bolt). Four plated 5/16-18 x 6-1/2” carriage bolts are pressed in. The clamp bar and top plate are pressed by using four over-sized 2-1/2” diameter polypropylene soft feel fluted knobs with thread inserts for extra ease in clamping down tightly. 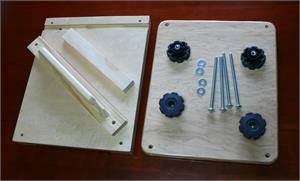 Light re-assembly of bolts to plate by user. No tools are needed. Special size beds, materials, configurations, edges, or knobs, etc. will be cheerfully quoted upon request!